Channel between Récif de l'Infernet & Barrier Reef, 20°36.2'S, 164°11.0'E, 12-15m, in Lagoon, off Koumac, New Caledonia, grey sand substrate, 11 October 1993, shell length 15, 20mm, AM C200438. PHOTOS: Bill Rudman. Akera is a primitive representative of the Anaspidea (Sea Hares). It has an external shell which protects the visceral hump, but is not large enough to contain the whole body. The shell is only lightly calcified and empty shells are easily broken. It lives in muddy environments and the body has a streamlined shape, designed for burrowing. The anterior part of the body is able to extend out, much like a bivalve's foot, to assist in burrowing. 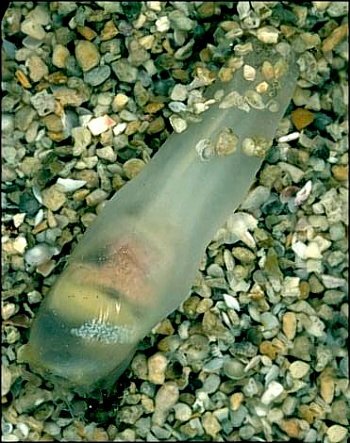 In general, the shape of Akera is very similar to bubble-shelled cephalaspideans, like Atys, with a headshield, no head tentacles, and with the sides of the foot folded up to form parapodia. This similarity in shape was the reason that until reently many workers considerd Akera to be a cephalaspidean, despite its internal anatomy which is clearly anaspidean. Little is known of the biology of Akera soluta other than it sometimes occurs in very large numbers. 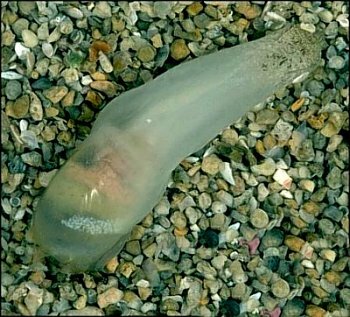 It apparently spends much of its life buried in sandy mud, with only the head end of the body emerging. This explains the unusual colour pattern with the mottled pigmentation, apparently camouflage colouration, restricted to the anterior parts of the body. The shell of Akera soluta grows to about 45mm in length. The European species, Akera bullata, has been the subject of many studies. It is herbivorous and capable of extended periods of swimming. • Gmelin, J.F. (1791). In: Linnaeus, C., Systema Naturae, Ed.13. 1(6): 3021-4120. • Morton, J.E. & Holme, N.A. (1955) The occurrence at Plymouth of the marine opisthobranch Akera bullata, with notes on its habits and relationships. Journal of the Marine Biological Association, United Kingdom, 34: 101-112. • Morton, J.E. (1972) The form and functioning of the pallial organs in the opisthobranch Akera bullata with a discussion on the nature of the gill in the Notaspidea and other tectibranchs. The Veliger, 14(4): 337-349. • Thompson, T.E. & Seaward, D.R. (1989) Ecology and taxonomic status of the aplysiomorph Akera bullata in the British Isles. Journal of Molluscan Studies, 55: 489-496.